Sheldon likes to play bongos. . Wallpaper and background images in the The Big Bang Theory club tagged: the big bang theory cbs. This The Big Bang Theory photo contains reading room, athenaeum, atheneum, bookshop, bookstore, and bookstall. 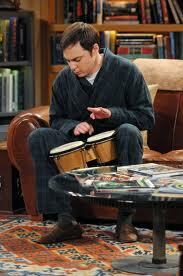 Hello Leonard, do you like my Bongos? I bet you didn't know, that I had Bongos!